What starts small can grow, filling you up completely and renewing life, giving a new direction. I know this. It happened to me. Of course, at the time I started, I didn’t know this, but just listened to an inner calling. Taking a step brought a complete change of focus. I’ve written about this before. I was compelled to take photos of crosses. And then several months later an idea came to do something with my photos. Just some little images in my iPhone only seen by me. I wanted to help a little girl I met in Cuba who had just about nothing. 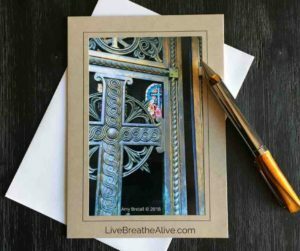 My initial idea was small – make greeting cards with your photos. But then, as I kept taking steps, it turned into something more. Just like faith…it grows. When you get started, be sure, the devil wants to distract you. It comes in the form of self sabotage talk. “Is this really anything?” “Who is going to care?” “Who is going buy that?” “It’s just some photos you took.” This is where YOU have to stand up and dig into your muscle of Faith. I heard my inner good voice. Yes, yes this is something. Yes, it’s important to me. Yes, I believe it is for ME to do. And this week somebody says to me in passing, “I know where I recognize you…you do the cross photography. It’s beautiful.” Wow! Being recognized for my cross artwork? All from starting with a little idea. Some photos in my iPhone. As I think about other things to do the devil still wants to interject. And a timely email appears from Dr. Wayne Dyer including a quote of his: “The passion that you feel is God inside of you beckoning you to take the risk and be your own person.” Yes! Little encourages to help propel forward. I was giving thoughts of what to do with some stories I have written about my Sweet Jean. “Does it matter?” Yes, to me it does. I honor my Jean. And maybe this little collection of writings can help someone, give a lift, help inspire love, help soothe a loss, and to see faith anew. Do something that requires faith. Step out! Step up! Rely on your faith. I’ve learned, there is power in the small. There is power in taking action. And there is most certainly power in love. The little things in life are big! LIVE your inspiration! BREATHE in Faith! Be ALIVE in your Doing!